Please visit the Corpus Christi Watershed web site for updates. The following list will continue to grow & be updated. Most of these are Catholic hymnals; some are Anglican ones. Many were scanned and made available by Corpus Christi Watershed, others by Google. * An asterisk indicates the book is particularly noteworthy. "Terry was able to establish at Westminster Cathedral a tradition of musical treatment for the whole of the Roman liturgy in England based on the principles laid down in the Motu proprio, so that the Use of Westminster offered an example to Roman Catholic church musicians unequalled anywhere outside Rome itself... His Westminster Hymnal (London, 1912, rev. 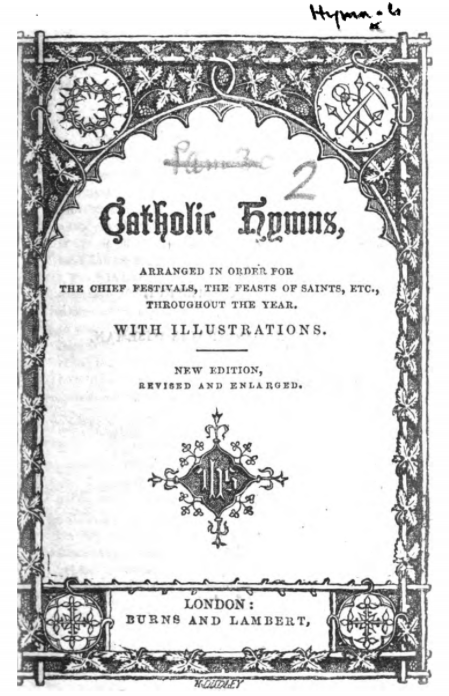 3/1916, 7/1937) was for many years the standard hymnal for Roman Catholic use in Britain." It offers deep insight into his revival and nurturing of Catholic music in England. This book includes the Motu Proprio of Pius X. It represents the groundwork that was laid for the 1912 Westminster Hymnal. I am quoting the Dedication below. I esteem it a privilege to dedicate this book to you. It was entirely due to your support and encouragement that I was able, ten years ago, to begin the work of reviving, on anything like a large scale, the forgotten music of our English Catholic forefathers, and to restore to the Church in their original Latin form, compositions which since 1641 had only appeared in English dress. And it was to your support, as Head of a great Abbey, that it became possible to restore these works under almost the same ideal conditions which obtained in the old days—in a Monastery Church with its school attached, where daily Mass and Office were said; and where the life of the Church was lived from day to day, by monk and scholar, in the quiet seclusion of the Mendip Hills, far from the hurry of roaring towns. It is, moreover, specially fitting that this revival should have taken place at Downside, since the Downside Benedictine monks are the same identical community—without a break in the chain of their continuity — who served Westminster Abbey in the old time before the dissolution of the monasteries. Dealing as this book does with Catholic Church Music in the light of the Motu Proprio, it is pleasant to place on record the share which Downside took in the work of reform so many years before the Motu Proprio was published.